Retired Anglican Bishop Sebstian Bakare, born in 1940, is an iconic figure in Zimbabwe whose work in the church and society has one connecting thread – quest for social justice and equality . Bishop Bakare has lived his entire life fighting for human rights, freedom and dignity for his people. During the Liberation struggle in the 1970s Bishop Bakare actively mobilized support for the struggle for independence because he considered the struggle to be just. However in the post-independence era he found himself sharply disagreeing with President Mugabe’s style of leadership, especially human rights abuses and unfulfilled promises. In 1993 Sebastian Bakare published a book: My right to land, in the Bible and in Zimbabwe: A theology of land for Zimbabwe in which he asked President Mugabe when his government was going to fulfil the land promise. Sebastian Bakare also castigated the use of violence by the ruling party in the 2000 and 2002 elections. 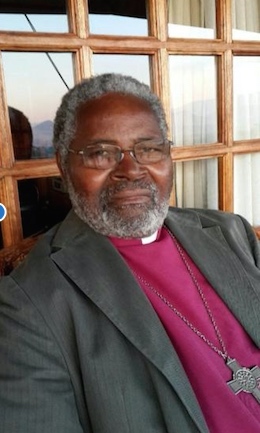 When a ZANU PF apologist Nolbert Kunonga tried to illegally claim ownership of the properties owned by the Anglican Church in Zimbabwe Bakare was requested to come out of retirement and become the Bishop of Harare in 2008. As Bishop of Harare Bakare raised international awareness on the persecution of the Anglican Christians in Zimbabwe by the renegade Bishop Nolbert Kunonga through the State security agents. On 10 November 2008, Bishop Bakare was awarded Sweden's 2008 Per Anger Prize for his "committed work for human rights in a politically unstable Zimbabwe." Bakare took the opportunity of the award to highlight the deteriorating situation in his country. “It is like a war, in the sense that there is total absence of peace," Bakare told Swedish radio news about the conditions in Zimbabwe at the time. Whilst many clergy have decided to withdraw from the struggle for social justice and human rights or to re-join the ruling ZANU PF altogether in exchange for monetary gains, Bishop Bakare has remained principled and committed to building a peaceful and prosperous Zimbabwe. Currently he is coordinating the National Convergence Convention whose theme is Unity in Diversity: A Dialogue of Concerned Citizens. The convention, to take place over two days in September 2015, will bring together over a thousand progressive Zimbabweans to chart a way forward in light of the rapidly deteriorating human security situation in the country. This is a bold step given that the event will be the biggest multi-stakeholder consultative gathering since the 2013 election. The event will highlight the hardships Zimbabweans are experiencing due to the failure by government to halt the economic decline. Asked why he continues to speak out against rights abuses given the risks associated with criticizing President Mugabe’s government Retired Bishop Bakare said, ‘I do what I do, what I have been doing and what I continue to do because I believe in justice and peace…if I see injustice being perpetrated against a brother or a sister I find it very difficult to turn a blind eye and pretend I saw or heard nothing’. He said he was inspired by Old Testament Prophets who stood up against injustice. He gave an example of Nathan who confronted David concerning the death of Uriah. Giving further examples of Elijah, Jeremiah and Amos, Retired Bishop Bakare said a defining characteristic of a Priest of God is to condemn evil, no matter the status of the perpetrator in society or the risks associated with speaking out. Bishop Bakare is no doubt a Giraffe Hero who continues to stick his neck out at a time majority of the clergy are being co-opted by the ruling elites or are simply indifferent to the suffering of the people of Zimbabwe.